I just realised we’re almost at the end of May and I haven’t shared my Instagram Inspiration for May yet! Where is the time going? In fact, I’m a little scared that the year is slipping by so fast, not only does it mean I’m getting older (like I worry about things like that…lol) but that I’m really not achieving much on my 2018 to do list. In all honesty, it’s a fairly dreary list, for the most part, full of admin chores like updates to my website and decluttering activities. But there were also a few gems about future goals that I want to achieve, renovations I want to undertake and maybe getting around to starting my book. I’ve always said I’d write a book, and in fact, I did when I was a teenager. Probably best I don’t unleash that teenage angst on anyone. I’ve managed plenty of travel so far in 2018, and for that I am extremely grateful and encouraged, especially as there is more in the pipeline. However the year is speeding by so fast I haven’t stopped to smell the proverbial roses, I’ll just have to make do with the sleep-inducing essential oils from ThisWorks I use every night (not an ad, I’m just a fan). So we’re very much near the mid-year, and it’s probably best I do find a moment to take a deep breath, review that list and maybe revive it – or in a more likely scenario tear it to shreds and breathe a sigh of relief. So where do I start so late in the month with sharing Instagram gems? I thought I’d share some thoughts on what I think are visually interesting Instagram accounts to follow from some wonderful architectural visual storytellers, those with a minimal but colourful grid. These photographers keep a minimal palette AND shoot in a minimal style. It’s popular admittedly, but I do certainly find it visually arresting to see architecture shot in this way, particularly when it is highly saturated. It’s almost a contradiction though, minimal but colourful sounds confused. Surely colourful is about maximalism not minimalism? Not in the hands of these Instagrammers. 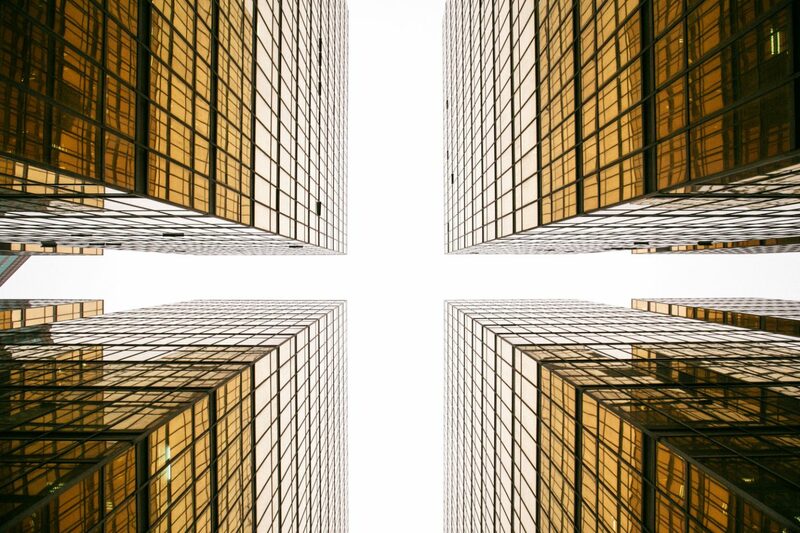 Hong Kong based photographer Victor Cheng’s @veeceechenge Instagram account is always impeccable, and I’m especially drawn to his architectural and ‘places’ shots. He’s the photographer behind one of my all-time favourite Instagram shots of the candy-striped stairwell in Hong Kong. All photographs above by Victor Cheng. Another favourite account of mine is Geli Klein’s @GeliKlein Instagram account filled with sensational pictures of Cologne. 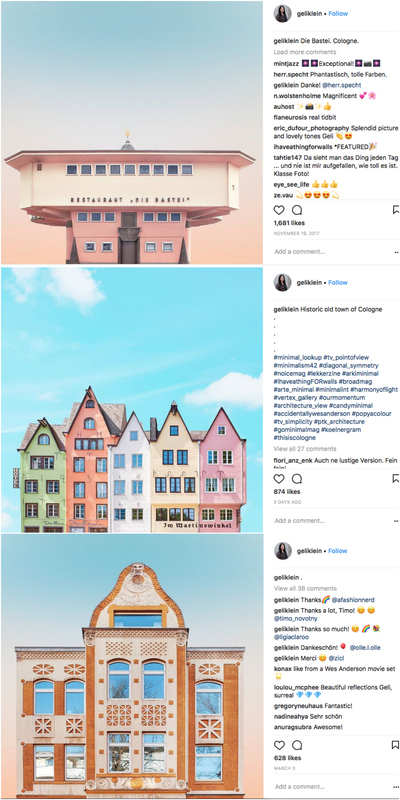 Architecture dominates her feed, and her images regularly feature in the Accidental Wes Anderson Tumblr, and Instagram feeds. Her photographs are heavily edited and have an incredible colour palette, more like an art version of Cologne than how the city really looks. More high saturation and architecture can be found over at Marcus Cederberg @marcuscederberg who’s Instagram feed is awash with vibrant colours, repetitive patterns and lots of negative space. I read an interview with the Swedish photographer where he shared that he liked no more than three elements in a photograph when he was composing them for his grid. More akin to artworks than reality, like Gelli above, his images are heavily edited to create a pleasing arrangement. It’s definitely a colourful selection this month and way more edited and curated than my Instagram feed. What do you think inspirational or too far from reality? I kinda feel like it’s both, to be honest, and I love them nonetheless. To see my previous Instagram inspiration recommendations visit here.